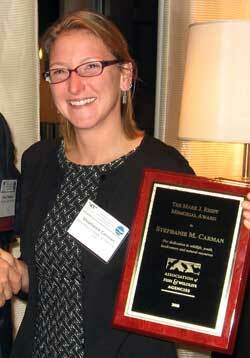 SANTA FE -- Stephanie Carman, an aquatic species biologist with the Department of Game and Fish, was honored as the young professional of the year this month by the Association of Fish and Wildlife Agencies. Carman received the Mark Reeff Memorial Award, which recognizes accomplishments of young professionals facing challenges in fish and wildlife conservation work. Peer professionals in New Mexico nominated her for the award based on her work developing recovery plans for endangered or threatened aquatic species including the Zuni bluehead sucker, roundtail and Gila chubs, White Sands pupfish, and the Texas hornshell mussel. "As the Department's first Aquatic Species Recovery Coordinator, Ms. Carman showed determination and ingenuity, forging strong professional relationships while becoming versed in often complicated state, federal and tribal laws and regulations," Department Director Bruce Thompson said. "Her first recovery plan became a template for others to come, and in fewer than five years she gained widespread respect among diverse interest groups and agencies." Carman received her award at the Association of Fish and Wildlife Agencies annual conference Sept. 10 in Saratoga Springs, N.Y.